The fried tacos are also known as flautas (flutes) because they are tacos of crispy consistency and rough texture – that look very similar to the musical instrument. The flautas that are going to be prepared are filled of chorizo and potatoes; which is a fantastic combination. The chorizo’s strong and condimented flavor is soften with the delicate flavor of the potatoes. If you don’t like strong and elaborated flavors, this is your dish. – Besides over the flautas various fresh ingredients are put to garnish them , in this way they don’t taste as dry and they fill with flavor. This is a dish that is served as main course and they are normally served plain because the fried tacos are so abundant, that there is no room remaining for anything else... well may be a Mexican drink. 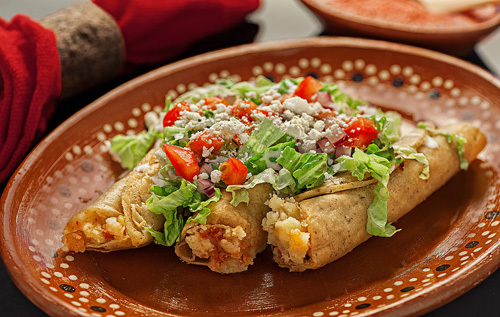 To make the flautas there are many steps to follow and some experience in the kitchen is required. In this recipe the tortillas are going to be fried and we recommend using vegetable oil and not olive oil because it is the most adequate for frying dough. Prepare the fried tacos with your corn tortillas. If you want you can also use homemade chorizo in this recipe. Leave the potatoes cooking in the boiling water for about 20 minutes, until they are soft. Slice 1 tomato, then reserve. Finely chop 1/4 of an onion (1.2 oz) and 7 oz of chorizo; then set aside. Verify that the potatoes that were left cooking are soft; if not cook them for a longer time. To know if the potatoes are ready, spear a fork in them. When you feel that the fork goes in and out smoothly, the potatoes are ready. Remove from the saucepan the potatoes, with a kitchen spoon and rinse them with cold water. Heat in a frying pan over medium heat 1/4 tablespoon of olive oil. Put in the frying pan that onion that was minced and fry it for approximately 1 minute, until it looks a bit transparent; stir regularly. Incorporate in the frying pan the chorizo that was minced and fry it for about 3 minutes, until it is moderately cooked; stir regularly. Add in the frying pan the mashed potato that was prepared and mix all the ingredients. Fry the frying pan ingredients for about 2 minutes, until the chorizo is well cooked; stir regularly. Then set aside. Remove from the griddle the tortillas and put on each tortilla some of the filling that was cooked. Put in the frying pan the chorizo and potato tacos that were prepared (just the ones that fit in) and fry them for about 2 minutes starting from the end where the tortilla was closed, until they are moderately fried; turn them regularly with some tongs. Transfer from the frying pan to some paper towels, with the tongs, the fried chorizo and potato tacos so they dry and the fat excess is absorbed. Remove from the fried tacos the toothpicks, then reserve. Repeat the same procedure with the chorizo and potato tacos that were not fried, it won’t be necessary to add more vegetable oil in the frying pan. Finely chop 1/2 onion (2.4 oz) and reserve. Transfer from the paper towels to a large plate the fried chorizo and potato tacos that were prepared. The Tomato slices that were cut. Suggestion: You can add to your fried tacos green salsa or red – they taste exquisite. Variation: The fried tacos can also be prepared with beef. Did you like the Flautas? Use some good tongs to fry your flautas, because they go through high temperatures. Would you like to try the flautas with a spicy chorizo?